I thought about setting up this page for a long time. I wanted to consolidate some of our experiences of Down Syndrome (DS) for easier access to the posts, but I hesitated to put K on the pedestal and it is certainly not my intention to emphasise the fact that she has one more chromosome than us in all her cells. K is just like any other child, and sometimes, (well, most of the time) we forget that she has DS. When K was confirmed to have DS, I tried to search for stories to prepare myself for this new parenting journey. I read a few "textbook" articles about Down syndrome and I stopped reading those - they paint a far too gloomy picture of what was to come for my newborn. I wanted to read stories about the hopes and happy moments, as well as the challenges of the parents. I read plenty, but I wanted more. I wanted stories from local families. Stories of how families cope and support their children with Down syndrome in our cosmopolitan city. 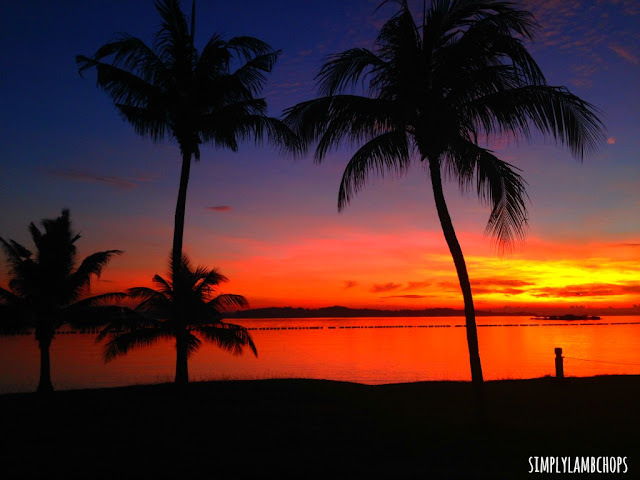 Success stories of their educational experiences and day-to-day living. 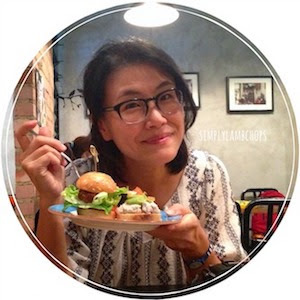 I couldn't find any back then, so I decided to share our stories so that you know you are not alone in this unfamiliar journey. Perhaps you have just received a prenatal diagnosis of DS, or you have a new baby who has received the diagnosis after birth. Perhaps you are reading up about DS because a friend or a relative's baby has just been diagnosed with the condition and you want to help. "CONGRATULATIONS!" is the first thing I want to say because this is a new beginning and you have a baby so wonderfully made. You might not be feeling this now, but as you walk this journey with your child, you'll realise that he will be a strong part of your family, loving you, contributing to the community, and teaching you what truly matters in life. Take time to know your baby and enjoy his company. Shower him with lots of love, hugs, and talk to him. Every child is unique - that is true even for our children with DS. Be patient with him as he explores the world at his own time. He will learn and develop well when he knows that he is loved by his close ones. Most importantly, believe that he can, even if someone tells you he can't. Excuse me, is she a Down's baby? All about K: She is THREE! Talking Point 2016 (Episode 15) - An Inclusive Singapore? Down Syndrome Association of Singapore - DSA aims to provide support to families and caregivers, help a person with Down Syndrome to lead a normal life and contribute to the society, and help integrate a person with Down Syndrome into mainstream society. You can also visit their Facebook page. Singapore for Down Syndrome, a closed group on Facebook - This is an FB closed group for parents of children with Down Syndrome in Singapore. Please email Grace at squirrelwee@gmail.com if you wish to join the group. a close-knitted chatgroup (on WhatsApp) for Mommies of children with Down Syndrome - Entry to this group is by invitation and recommendation. You can email me at simplylambchops(dot)gmail(dot)com to find out more. After I delivered K, I relied on these books to give me comfort and hope in this new parenting journey. The books are popularly used among new parents and have been very useful for me. I still keep them to refer to occasionally or to pass around among new parents who have children with Down Syndrome. 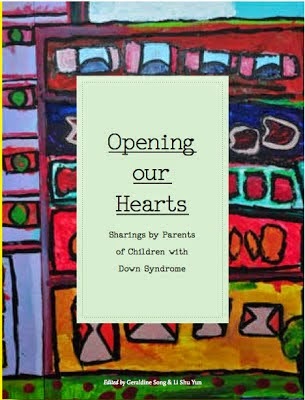 (this book is written by parents of children with DS in Singapore. 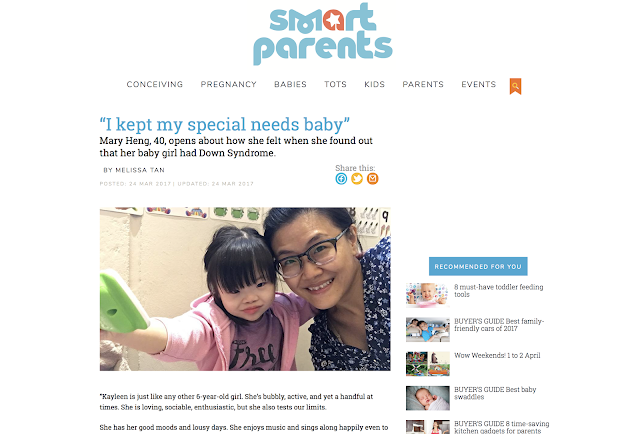 If you are also based in Singapore and you keep a blog about your child with Down Syndrome, let's link up! You can drop me an email with your blog url and I'll include a link to your blog on mine. Do you know that there is a list of Top 100 Down Syndrome Blogs on the web? This little blog of mine has been selected into the list. Thanks to all of you for making this happen! Check out the list for the other blogs!